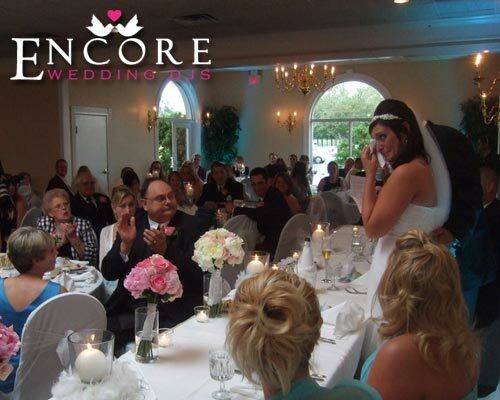 The Gazebo Banquet Hall in Warren is a great place to plan your reception, and this is where Gina and William celebrated theirs. Their staff does a nice job with the food and they even light these flame candles when they flambeau the beef. Their colors where a light teal, so the lighting design matched the decor during dinner. Once the dance floored opened up, we mixed it up with a bunch of classic throwbacks that made it onto their request list. Here what Gina had to say about our services by clicking here. Thanks again guys!